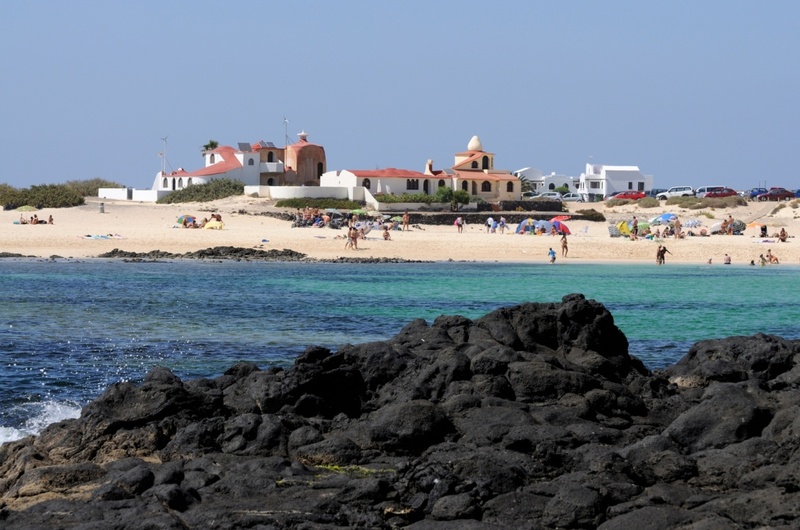 If you are looking for a relaxed place to sink your toes into the sand, Cotillo is for you. This lagoon style beach area is located on the north-west side of the island. The nice lagoons created by the shore-line are a great way to enjoy the marine life and the crystal clear waters. The snorkeling here is amazing and it's really fun for the kiddies. There are several little pools and lagoons and it is a great place to let them slash around. There some spots where the water is only a foot deep in the entire lagoon, little fishes swimming around. The wind here is sometimes a bummer and it gets a little breezy on occasion but with such nice scenery, who cares? The many lagoons and puddles spotted around the shore are there for the choosing. A 10 square foot island surrounded by blue-green knee deep water is the best bet. If you find yourself feeling a little dried out just roll yourself into the water. There are a few hotels that have lagoons ten meters from the backdoor. There are other areas of Cotillo, south of the lagoons, where the waters are difficult and have quite a strong under-toe. In these area you will see cliffs where large waves break and you should steer clear of them. If you are on the island to surf this is a great place to jump in. The swells further out are decent, but again the waters are difficult and should not be tried by amateurs. The wintertime has the largest surges. The small town next to the beach has a few bars and some good surf and kite shops. There are little shops for food and ice-cream as well. The fish restaurants around town are really good and have fish caught that day on as specials. To the north of the lagoons is the light house. It's a good place to get the camera out and get the 'holding the light house between my fingers' picture. There are two towers to look at and you can also go in and have a look around. The waters north of the light house are massive and if you are quick you can get some really good pictures at sundown. The wind here can be quite strong so bundle up just in case. There are multiple hotels here and finding a place last minute should be no problem. Maybe just come for a day. Cotillo is becoming a new hotspot for the island lover and many travelers are coming back again and again. Recently, its famous musical festival is becoming more popular and attracting a lot of visitors, due to the high quality bands they are promoting there. Find information about selected Hotels, apartments and rooms in Cotillo to choose the perfect place for your accommodation.